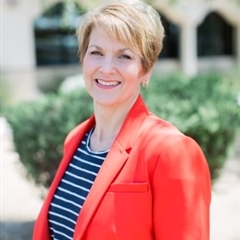 Jean Christofferson is the director of marketing for Catholic Charities Community Services, a nonprofit charity, which helps more than 14,000 individuals throughout seven counties in central and northern Arizona each year. She leads a small team to create, manage and track all marketing, communications and public relations campaigns and is responsible for the overall marketing and communication strategy and execution for all 22 programs throughout the state. Prior to her work at Catholic Charities, she was managing editor for WorldatWork, a nonprofit association for HR professionals, where she led a complete print and electronic redesign of its award-winning member magazine as well as managed a team of writers and editors responsible for all editorial content. She is the volunteer communications specialist for Saving Paws Rescue AZ, a local nonprofit dog rescue, which has saved more than 1,200 dogs from an uncertain fate in the last five years. She holds a bachelor’s degree in Journalism from the University of Missouri – Columbia and is originally from the St. Louis, Mo. area. She moved to Phoenix in 1995 and lives with her husband, two teenage sons and three dogs and a cat.